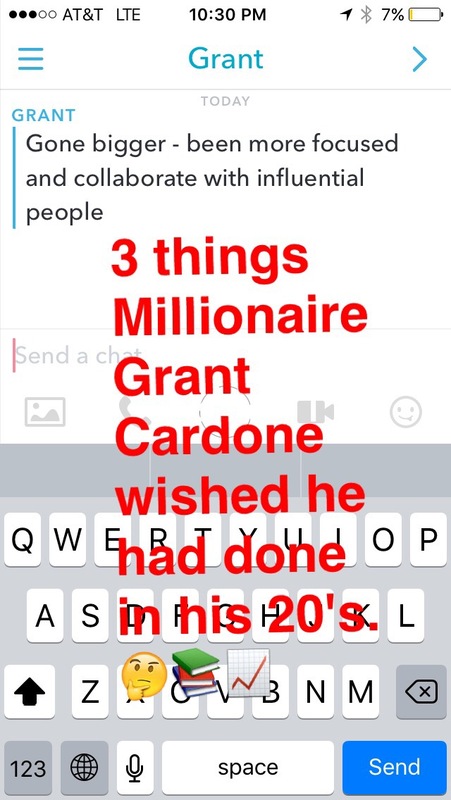 Grant Cardone (@GrantCardone on Snapchat) opened his Snapchat to a Q&A. I asked him what were 3 things he wished he had done in his 20’s that he didn’t do, and his response was very insightful. This was a surprise to hear from the 10X Man who has a beautiful family, lives on the beaches of Miami, has his own customized private jet and has made a name for himself in the realm of sales, real estate and public speaking. At Alex Becker’s ’10 Pillars Of’ live event, Grant Cardone gave a touching story about his younger years. He talked about how he was hanging with the wrong crowd, doing drugs and was broke. He turned that all around years later, but to apply this into my life will be: to not be scared of going big. 10X my workouts, 10X the amount of time I put into the blog, school and running a business, 10X my goals, 10X my mindset and 10Xing any area of my life that I can. The faster you learn the better. Slow learners do not get rewarded. To collaborate with people ten or twenty years ahead of you is the quickest way to learn your craft and master it ad I believe this is what Cardone was hinting towards to. Fining influential people that It can open many doors for you. Hope you enjoyed those words from Grant Cardone. Whenever I make the chance to learn something valuable from an influencer I will save it to this space. Go ahead and share this with someone who would be intersted in this. I would really appreciate it. Next Next post: Why To Automate Your Business Marketing, Pro’sand Con’s.